Within weeks of discovering this old photograph of the SS Dominica in our family’s collection, I came across an interesting article in the newspapers about this very ship! During Governor Pearson’s term (1931-1935), he promoted the love of music and the arts by inviting various groups of singers, and lecturers to the island. In 1932, the Hampton Quartet and Elsie Baker performed. A few years later, Miss Louise Stallings and Dr. Clarence Cameron White arrived. All delivered beautiful recitals that the audiences enjoyed. 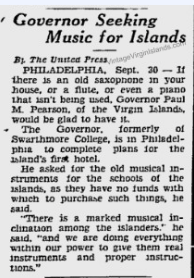 When Governor Pearson learned of the incredible talent in the islands in need of musical instruments, he set about soliciting help from those on the US mainland. He wrote a letter that was published in the June 21, 1932, New York Times and another request for instruments in the Pittsburgh Press. Incredibly, all of his efforts were successful! 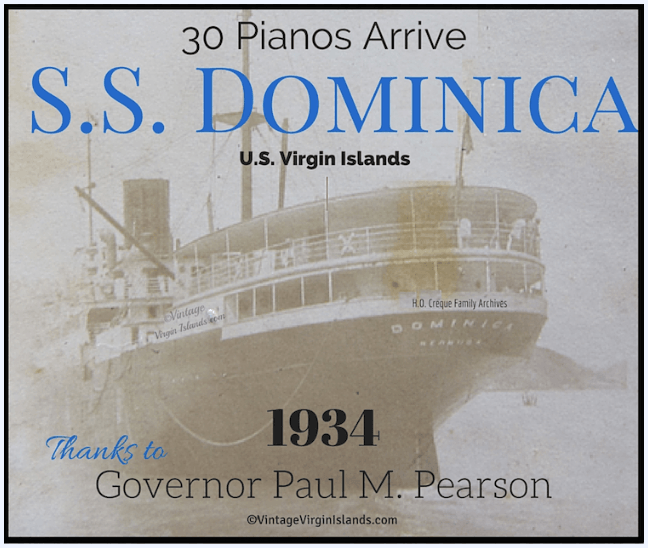 On August 7, 1934, the SS Dominica dropped anchor in the Charlotte Amalie harbor with thirty pianos for the artists in the islands! According to the VI Daily News article of August 9, 1967, the talented Music Man, Bill La Motta was one of those lucky recipients. 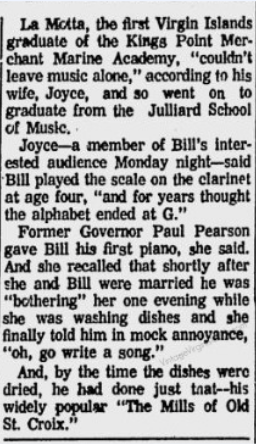 The St. John Drum, July 26, 1974 issue covered Ms. Meada Keating Titley’s memories of receiving a piano too and as a courtesy, the added benefit of a piano tuner to tune it for her. 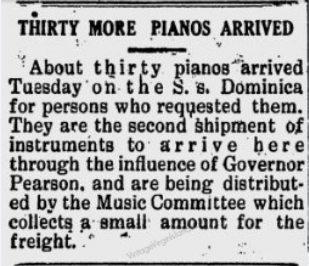 Do any of the readers know who else was fortunate to have received a piano or where they all are today? Below are a few newspaper clippings of the event.